A Pennsylvania mother of two of has stood-up to the internet-battling escapades of the artist formerly known as The Artist Formerly Known as Prince. This summer, "mother, wife, writer, and editor" Stephanie Lenz filed a federal lawsuit against the artist's former record label, Universal Music Group, for ordering the removal of a YouTube video in which her eighteen-month-old son boogies to the Prince anthem "Let's Go Crazy." The funkadelic pop star recently launched a very public crusade against unauthorized use of his name, image, and music catalog across the net, and the word from ABC News is that he personally told Universal to have the video taken down with a wave of the US Digital Millennium Copyright Act (DMCA). With her civil action, filed in a California-based federal court, Lenz claims that she was well within her rights when she posted the video, which contains less than 30 seconds of music. She wants the video clip up, and she wants damages. Well, the video is already back up, so scratch that part. Backed by the Electronic Frontier Foundation (EFF), a well-known internet watchdog, Lenz also hopes to teach Prince and his a label a lesson - and protect the rights of file sharers everywhere. "The idea is to keep copyright owners honest," EFF staff attorney Corynne McSherry told The Reg. "To keep them from abusing [the DMCA]." It's the same lesson laid down by our favorite light-sabre-wielding Jedi Knight. 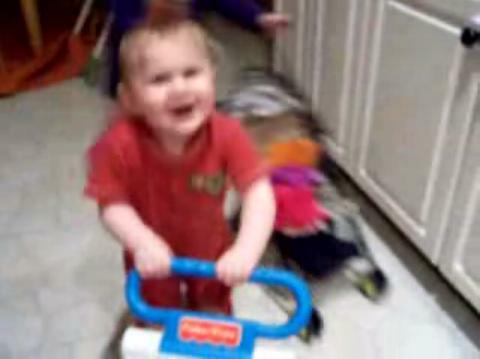 In early February, Stephanie Lenz videotaped her eighteen-month-old son Holden as he motored around the family kitchen. "Let's Go Crazy" played in the background, and at one point, the toddler decided it was time to cut a rug. According to the suit, "Let's Go Crazy" had been a favorite of little Holden's ever since he saw Prince perform during halftime of last year's SuperBowl. Lenz then chucked a 29-second clip of the toddler's Prince-powered dance-fest onto YouTube "for her friends and family to enjoy." But less than four months later, Universal hit the Google-owned video-sharing site with a DMCA take-down notice, claiming that the Lenz Dance Video violated its copyright. And YouTube took it down. "A well-placed source directly involved in the situation" told ABC that Prince was "directly involved" in the take-down notice. "This guy scours the Internet," the source said. "He's really intense about this stuff." Someone inside the company told us much the same thing. "We have a deal where we license music to YouTube, and it's a great arrangement," our source said. "The only caveat is that if an artist or a songwriter decides they don't want their music up there, they inform us, and we ask YouTube to take it down." Prince recently enlisted a British firm known as Web Sheriff to help with the removal of Prince-infringing material from YouTube, eBay, and the Swedish-based BitTorrent site PirateBay, but the Lenz Dance Video predates the firm's involvement. When we spoke to head Web Sheriff John Giacobbi, he confirmed that his company had nothing to with the take-down notice. Whoever ordered the take-down notice, Lenz wasn't too happy about it. She soon contacted the EFF, and the foundation advised her to send YouTube a counter-notice, asking that the video be reinstated. But the video remained off-line for six weeks, and the foundation helped Lenz take things to court. According to the suit, the clip constitutes "fair use" of the "Let's Go Crazy" copyright. "You'd be hard pressed to find a better example of fair use," said EFF's McSherry. "It's entirely non-commercial. It's just a little snippet. And in fact, you can barely hear the Prince song in the background. It's just what her baby happens to dance to." Developers, developers, developers – sigh – 100,000 of them were booted too!